After much deliberation about what we were going to do with the backyard, it was decided that we were going to build a sandbox. My wife had found some plans for a boat shaped sandbox plan in a book, and we thought it would encourage many hours of play and fun. 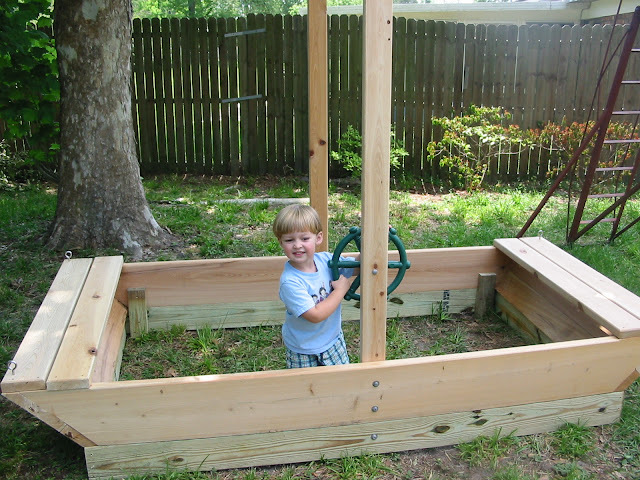 I remember my first sandbox that my dad made for me in our backyard. We bought some cypress 2x materials, as well as some pressured treated lumber for the ground contact stuff. We also picked up a plastic steering wheel (because how can you have a boat without a way to steer it?) We still have to figure out a canopy, as it’s designed to have a canopy above the mast for shade and it is secured with bungee cords. I also have some ideas about a small ship’s bell, and a pirate flag on the mast. We have to fill it with sand shortly, but the basic work is complete. UPDATE: We added a cover with the leftover “sail” material, which was basically fabric cloth we purchased which is primarily used as a garden shade cloth. It has grommets you can add, which was perfect, and with the leftovers, we made a cover for the sandbox, so we don’t have to clean it out each day. We also added a “buoy” that a neighbor gave us while he was cleaning out his garage. Makes it look more “boat-ish”. 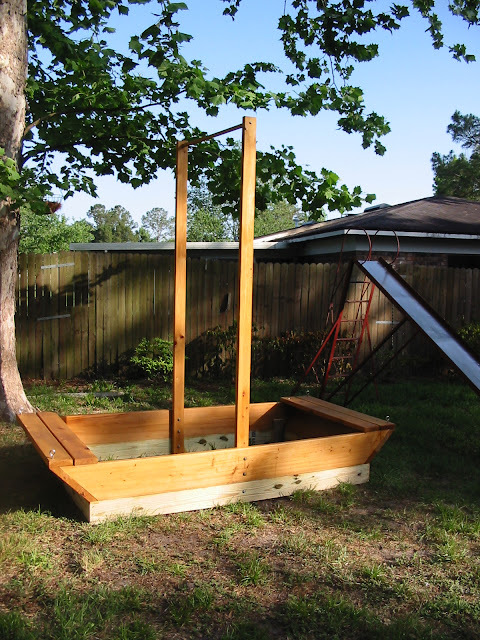 This entry was posted in Projects and tagged boat, cypress, pressure-treated, project, sand. Bookmark the permalink. Do you know what book your wife found the plan in?